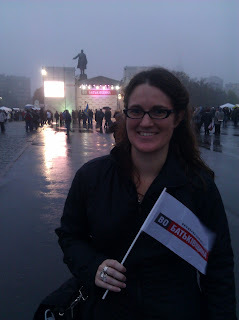 Since I was in Ukraine for the election I wanted to be involved in the election anyway I could. I tired to register to become an observer but by the time my emails arrived to the right organizations it was too late to register me. Then my adviser told me about the Maidan Project a local NGO in Kharkiv that monitors election fraud and I asked them what I could do to help! We thought it would be good to inform people about all the fraud reports in English and thought that their Twitter handle @sitemaidan would be a good place to post the reports. Here is the story they posted in the website about me! 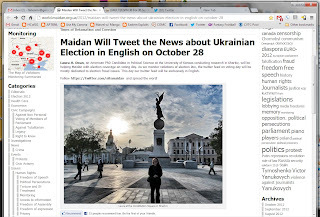 I went to their office on election day and I took the fraud reports submitted by normal average Ukrainians and translated them from Russian and Ukrainian into English. I also sent our general information about the election. Everything was going fine until around 4:30 pm when the site where people submitted the fraud reports suffered a DDoS attack. We soon learned that this attack was also directed at the opposition political parties and the other Ukrainian organizations who monitored election fraud. They did this so people couldn't submit reports and the biggest part of the attack was aimed at the Ukrainian version of the site. Maidan Project had been attacked twice before so they were ready for it and worked all day to get the site back up. Meanwhile people continue to submit reports via phone, skype, gmail chat, and facebook and we continue to tweet them. They also tried to hack our twitter feed but we were able to circumvent it thanks to my husband's quick thinking so we used a different twitter related site to submit the reports. We had to switch IP addresses a bunch of times but eventually things on the site were back up and running. The other organizations did not fare as well and were not back by the end of election day. It was pouring so I left the office around 10 pm but continued my reports until 11 pm. All is all I was glad to help out a local NGO, it was a good experience, and definitely much more exciting than watching the results come in on the news! This is a picture of me at the Maidan Project office after a long election day! While many of you in America are sick of all the election campaigning we arrived in Ukraine just in time for the election here! As a political scientist this is a very exciting time for me because I have never been able to live in a foreign country during an election despite reading about them for the past decade or so. The election is this Sunday October 28 and the campaigning has picked up in the last few weeks. Campaigning in Ukraine is a bit different than in the US. Of course there are all the political attack ads and everything but campaigning is limited to 90 days before the election so in that short time they give it everything they got! They basically stand outside with these tents rain or shine and hand out leaflets to anyone willing to take them. Billions of hryvnia were poured into this election which considering the average Ukrainian makes $300 a month that sum is significant in this not so developed country. Half of the Verkhovna Rada 450 members are decided using the first past the post system we use in the US the other is through parliamentary list voting so we saw signs for political parties and candidates. Here are some of the photos I took of political campaigning leading up to the election. This is the Party of Regions tent. They are the party of the current President Viktor Yanukovych and the ruling coalition. They dominate the Eastern region of Ukraine and I don't think that gentleman liked getting his picture taken! 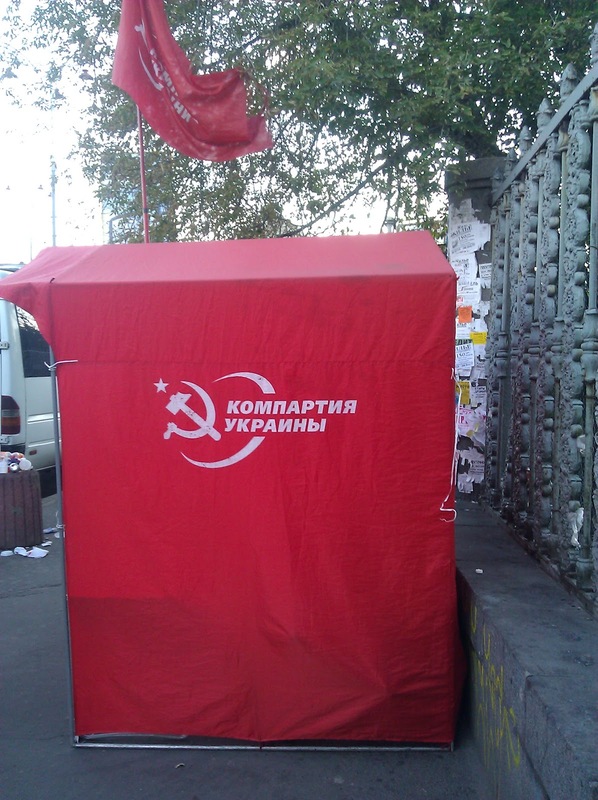 This is a tent for the All-Ukrainian Union Fatherland which is the party of the imprisoned former Prime Minister Yulia Tymoshenko. Clearly this is the Communist party which still gains some seats in the parliament. This is a campaign tent for one of the candidates in Kharkiv Vasili Saligina. 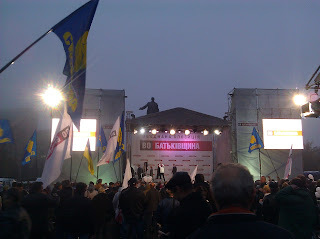 This is a political rally we found one evening in Freedom Square for the All-Ukrainian Union Fatherland and All-Ukrainian Union "Svoboda" a far right nationalist party. I have been collecting campaign paraphernalia so I chased some people around until they would give this foreign devyshka a flag! 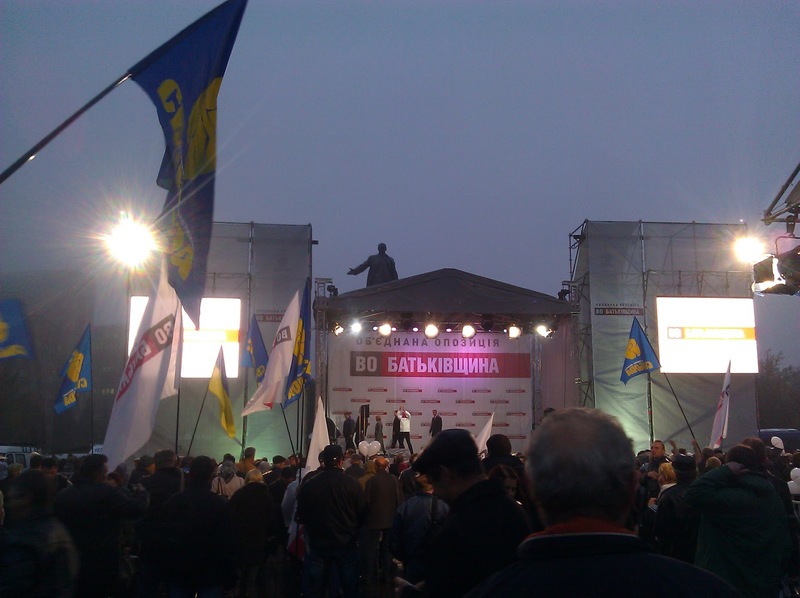 This is another rally I passed at the Kharkov National Academic Opera and Ballet Theatre on the eve of the day of silence for the Party of Regions. 24 hours before the election political parties are not allowed to campaign so this was the final party before the election! There were so many people that they spilled over to the other side of the street! Yesterday we went to Barabashova Market, which rivals a market in Odessa for the title of the largest market in Europe! The market stretches over 7 km and was very chaotic and overwhelming at first. We were there for an hour and we never even left the clothing section! We wanted to go to the market because my guide book said that there was restaurant in the center of the market that served real Vietnamese food. So we headed looking for a change from the normal meat and potatoes we have become accustomed to in Ukraine. Th metro stop was Academic Barabashova which I thought had something to do with the university dorms that are located near by. However, my Russian teacher told us that Barabashova was a astronomer and professor at Karazin Kharkiv National University. I am not sure how he would feel about this market being named after him as well or the diverse sellers from Southeast Asia or Africa but for me it was fun to speak to other foreigners in Russian. We all seem to give each other a break while speaking this difficult language and it's fun to hear the variety of accents! Here is a picture of the entrance to the market. We wandered down a bunch of these aisles looking for a red sign for the restaurant. Eventually we found it and enjoyed a wonderful meal! I had pho (noodles in broth) which I used to eat in Seattle and Matt had a rice and chicken dish. There was a ton of food and it only cost us around $10 so we will definitely be going back! I had a but of a rough week with some residency permit issues so we decided to go to the mall this weekend. It was actually because of the residence permit issues that I ended up having to drive all over town getting paperwork on Tuesday and I saw the mall during these errands so I guess the residence permit issues are not all bad! Whenever my husband and I talk about going to the mall we always sing this song from our favorite television show How I Met Your Mother. Now that you have been thoroughly entertained by that wonderful music video here are some pictures of our adventures. Me outside the mall giving it the double thumbs up! There was a hockey rink inside the mall and since hockey is my favorite sport it was very fun to see some kids scrimmaging on the ice! We had a huge pizza for lunch which was a little lacking in cheese but we didn't let that deter us! We also found Starburst candies at the grocery store so after a not so fun week it was nice to partake in some comforts from home! Yesterday, we had beautiful fall weather so we decided to venture out and visit a couple of the churches and a monastery in Kharkiv which turned out to be one holy day! This is a picture of me at Pokrovsky Monastery. Monasteries are sacred ground so if you don't want to be charged the tourist entrance fee you need to bring your own scarf and act like you belong! A random art fair we found on our adventures with some authentic and not so authentic art! This is Uspensky Cathedral (or the Cathedral of the Assumption in English) that is now a concert hall, thanks to the Soviets. Matt and I with a view of Blagoveshensky Cathedral, one of the tallest Orthodox cathedrals in the world, in the background. The is a close up of Blagoveshensky Cathedral which people in town call the candy cane church. I have been in Ukraine for almost three weeks and I am still dealing with some bureaucratic stuff related to my visa but I have been able to make some progress in other areas. The director of the organization that I am working with for my participant observation is taking exams at the moment so my start date there has been pushed back until her exams are done. These kinds of things always happen in fieldwork and is one of the reasons why I am glad I am here for a year because I have time to wait. Had I only scheduled a month or two this kind of setback would be debilitating to my dissertation since a large part is based on this participant observation at non-government organizations (NGOs). In the meantime I am concentrating on my classes and getting everything organized for my fieldwork. This week I made a contact list of all the NGOs I would like to interview throughout the country. I cross checked my list with recommendations from my contacts at the International Organization for Migration in Kyiv, the head organization of the umbrella group of anti-trafficking NGOs in Ukraine. 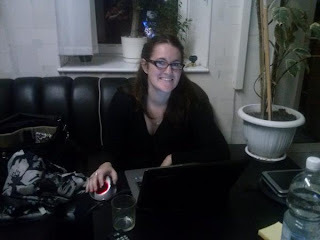 I also started arranging meetings and writing letters of introduction in English and Russian for my upcoming research trip to Kyiv in November. On this trip I am hoping to meet with the national level NGOs and begin developing a list of people in the government and bureaucracy that I should interview. I am also making progress in my Gender Studies class and the readings in Russian on gender theory are less daunting every week. For my Russian language classes, a new group of exchange students arrived from China and these students have two years of Russian. I went to class with them last week and now we are pushing to try and get our own Russian class organized. All the other students in the department have no Russian and they are put into language groups according to their future majors so they can concentrate on major specific language. The exchange students and I are just here to study Russian so they don't really know what to do with us. Still, we managed to convince our teacher to make the last hour of class more difficult for us so even that aspect of things here is going better than it was last week! This week the schedule came out for the Kansas Conference on Slavery and Human Trafficking and I am so excited and proud of all the work we put into creating this conference at the University of Kansas (to read about how we were able to develop this conference at KU please see my previous blog post Run to Free 5K). This conference is three years in the making and seeing the final program and conference website finally made it all real for me! My adviser and I, with the help of the wonderful people at the Institute for Social and Policy Research at KU, started with a list of people we wanted to bring in and then began meeting with people on campus to find co-sponsors for this event. In the end we were able to bring in the foremost academics on this topic with help from the Office of the Chancellor, Governor Sam Brownback, the School of Law, the Office of Graduate Military Programs, and the Women, Gender, and Sexuality Studies Department. There is a keynote speaker and then panels with local and international scholars on various trafficking research topics. Then there is a chance for audience involvement where we will have faculty and student working groups to discuss what we can do at KU to develop research and advocacy with the goal of combat trafficking. It is the first conference I have ever worked on and it turned out almost exactly how we envisioned it which I think almost never happens! I am just sad I will miss the actual conference because I am Ukraine conducting my fieldwork. Still, that doesn't take away the immense pride I feel about collaborating with other scholars at KU to make this event possible. If you are in Kansas January 31-February 1, please think about attending this event during human trafficking awareness month in 2013!